I was really excited when I first viewed this awesome push block. Having run my thumb through my table saw blade twice in my history of woodworking I immediately saw the advantages of the Microjig Gripper. Like everyone else that owns a table saw I have used simple push sticks and feather boards only to find that you just don’t have the control you need when moving a work piece through the blade. When I cut on the saw for a living I was comfortable to cut down to ¾” using my hands. The first time I caught my thumb I increased that to 1”, still feeling that I had more control of the work piece than with a push stick. The second time I ran my thumb through the saw I lost confidence in cutting small pieces all together. When I saw the Microjig demonstrated a smile came to my face from ear to ear. I could see that with this push block I would not only have total control of the work piece but I would have a renewed confidence in using my saw. When I got home I went to the task of assembling the Microjig. It went together easily but when I was finished I saw I had a few parts left over. I looked at the picture of the block and looked at the one in my hand and after a few seconds I decided to read the assembly instructions. Low and behold there was a use for all the parts! Excited I took it to the table saw, moved all the tools that were stacked on it and gave it a try. I quickly found out that the Microjig doesn’t work well on a rusty table with a dull blade. 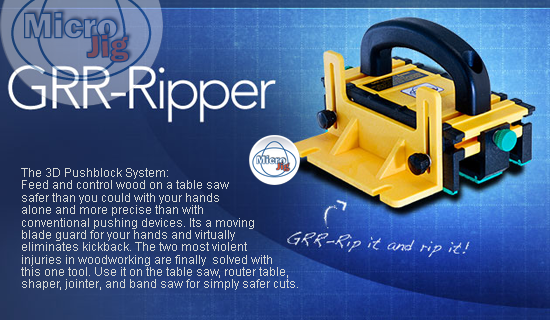 Make precise accurate cuts safely with the GRR-Riipper. Make consistent quality rips as thin as an 1/8" with the optional 1/8" Leg Accessory (most popular accessory). The GRR-Ripper comes readily equiped to handle extremely small and narrow stock allowing you to rip and dimension down to a 1/4" by 1/4" - try that with a pushstick. Working with small pieces on the table saw safely is just the tip of the iceberg when it comes to what you and the GRR-Ripper can accomplish. The GRR-Ripper Control System makes tricky cuts like bevel trimming simple and safe. Even when working with irregular-shaped stock, by using the edge of GRR-Ripper as a guide surface against the fence you can create a straight rip.